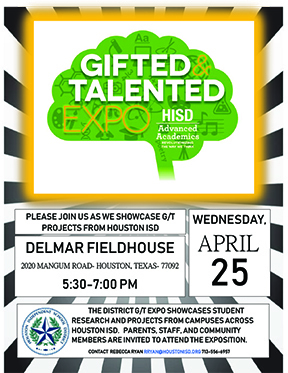 The first Gifted and Talented Exposition in 15 years will take place on April 25 from 5:30 to 7 p.m. at Delmar Fieldhouse (2020 Mangum, Houston 77092). Pre-K through 12th-grade gifted and talented students from across the district will present more than 450 research projects from 167 schools. The state of Texas requires gifted and talented students to participate in high-level research throughout the year. This student-directed research culminates in a research project that participants will present in a three-minute synopsis at the exposition. Individual schools will have tables displaying student projects, and their students will be presenting the results of their research to visitors. This event is free and open to the public. Advanced Academics encourages family and community members to come and see the results of these students’ hard work. For more information, contact Rebecca Ryan at RRyan@HoustonISD.org. This entry was posted in Gifted and Talented, HISD: Our Story, News, Special events and tagged GT Expo on April 17, 2018 by HISD Communications.